In Part One of this comprehensive and frequently cited treatment, the authors develop Euclidean and Bolyai-Lobachevskian geometry on the basis of an axiom system due, in principle, to the work of David Hilbert. Part Two develops projective geometry in much the same way. An Introduction provides background on topological space, analytic geometry, and other relevant topics, and rigorous proofs appear throughout the text. 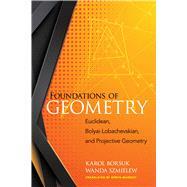 Topics covered by Part One include axioms of incidence and order, axioms of congruence, the axiom of continuity, models of absolute geometry, and Euclidean geometry, culminating in the treatment of Bolyai-Lobachevskian geometry. Part Two examines axioms of incidents and order and the axiom of continuity, concluding with an exploration of models of projective geometry. Dover unabridged and slightly corrected republication of the edition originally published by the North-Holland Publishing Co., Amsterdam, and Interscience Publishers, New York, 1960. Karol Borsuk (1905–82) was a prominent Polish mathematician and expert on topology and shape theory. He taught at Warsaw University and was a member of the Polish Academy of Sciences. Wanda Szmielew (1918–76) was a Polish mathematical logician who received her PhD at Berkeley in 1950, studying with Alfred Tarski. She is also the author of From Affine to Euclidean Geometry: An Axiomatic Approach.